Which span of the Memorial Bridge was completed first? | River Action, Inc.
On November 18 of that year, the governors of Iowa and Illinois—Clyde Herring and Henry Horner—helped dedicate the bridge. 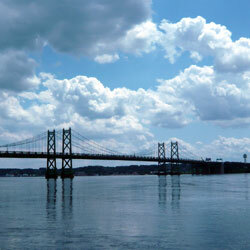 It was first known as the Iowa Illinois Memorial Bridge, named in honor of World War I veterans. A second, almost identical span, was added in 1960 downstream of the original. Then in the 1970s the twins were incorporated into the interstate highway system and the crossing became known simply as the I-74 Bridge. Dreams of a bridge between Moline and Bettendorf date back to before 1910 when industrialist William P. Bettendorf proposed to build one. After several false starts, the Davenport Bridge Commission was formed in 1931 to build and operate a crossing. The 5,148 foot long structure was built partly with depression-era Federal funds. And, remarkably, the initial 15 cent toll for automobiles remained the same from 1935 until 1960. The leader of the design team for the Memorial Bridge was Ralph Modjeski, one of the country’s leading bridge designers. Among the other suspension bridges to his credit are the Ben Franklin Bridge in Philadelphia, the Ambassador Bridge in Detroit, and the San Francisco-Oakland Bay Bridge. Modjeski designed seven other Mississippi river bridges, including the nearby Rock Island Government Bridge, which was his first major bridge project in the 1890s. U. S. highway 6 crosses the Memorial/I-74Bridge. From the 1930s to the 1960s, Route 6 was the longest transcontinental highway, stretching over 3600 miles from the end of Cape Cod in Massachusetts to Long Beach, California. In the late 1930s, local roads here were reconfigured to accommodate the highway. Among the projects were: a new the four-lane Kimberly Road bypass around the north edge of Davenport, a new four-lane 19th Street connecting downtown Moline to the Quad City Airport, and a new bridge over the Rock River.